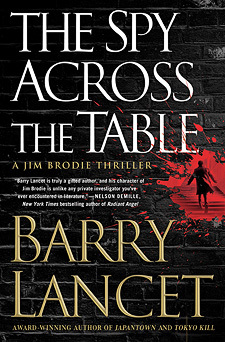 When is the next Jim Brodie book coming out? The Spy Across the Table, the fourth Brodie book, is due June 20, 2017. 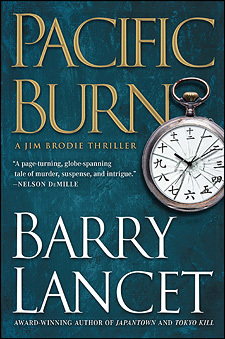 Pacific Burn, the third Brodie story, is out in paperback February 28, 2017. For the latest information on book releases and appearances, consider signing up for the newsletter, which is released sparingly and sent directly to your email in-box. News also appears on Facebook and on Twitter under @barrylancet. Do the Brodie novels have to be read in order? No, each book is written as a stand-alone, even though it is part of a series. Readers most often find the latest book, then go back and read the earlier stories. Are we ever going to learn more about Brodie's back story? 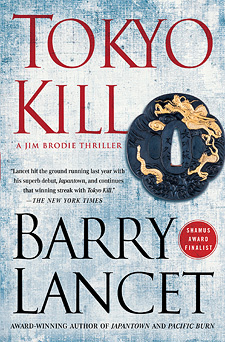 There is a Brodie prequel on the back burner about his father, his run-in with Tokyo's most powerful yakuza group, his first girlfriend, and more. Is it true you lived and worked in Japan? Yes, it's true. And I still live there, though I travel back to the States more often. Is Jim Brodie your alternate ego? There is some overlap. We've lived through many of the same things. We've been to the same places. I speak Japanese. He speaks Japanese. I've spent years in Japan. I've met yakuza and politicians and the spies (including a spy very much like the one who appears in the second book, Tokyo Kill, and is a featured player in The Spy Across the Table). I've met hundreds of artists and craftspeople and art dealers and others entrenched in the world of Japanese art. I've been allowed behind closed doors, beyond which most foreigners and Japanese are excluded. I only rarely get threatened or a gun pulled in my face. (The first in Japan, the second in Istanbul.) Over the years, I've absorbed a tremendous amount of information about Japan and Asia. For his part, Brodie knows as much about Japanese art and culture as I do. Where we disagree is which of us speaks better Japanese. The argument is ongoing. I do now. Didn't the first and second times I visited Japan. Truthfully? On a lark. There was no grand plan other than this: from a young age I wanted to live overseas for a time. Later, I targeted London and Paris as my first and second choices because of their publishing activities. Then I met some Japanese folks, and they said why don't you come visit? And I thought, "Why not? I'll go to Europe the long way around." So I did. Europe was great, but Japan lingered in my mind long after I returned to the States to finish my last year of college. Five years later I went back. I find the cultural aspects of Japan you introduce into the action fascinating. I also like the art background. How did you learn about Japanese art? There has always been art in my family. My grandfather was a talented woodworker on the side, though he never turned professional. My brother Marc is an artist. My parents hung affordable works by local artists on the wall. The art in Japan was so different it caught my eye immediately. Moreover, they elevated what we often consider "mere craftwork" to a higher level. It becomes art. Some were items you could slot into your life. Art you could use—ceramic plates or saké flasks with character. Not all of them, but the best of them were made with an eye of an artist. Among the first items I bought were saké cups. Known artist-potters throughout the country made them, in all different styles. How cool is that? And I would use them with friends when they came over for a drink. More pieces followed. I was particularly attracted to the quieter Japanese pieces, which included ceramics, ink paintings, calligraphy, and more. So even back then there were shades of Jim Brodie without my ever knowing it. Everyone says Japanese culture is so impenetrable. How did you manage to get a handle on it? Endless patience, observation, and a stubborn refusal to give in. All these were the key factors, as was learning the language. Over all of that, I layered on more patience. Speaking to Japanese in their native tongue has been one of my greatest pleasures. So much so that if I had things to do over again, I'd learn as many foreign languages as I could. And foreign languages, I'm ashamed to say, was hands-down my worst subject in school, so if I can do it, anyone can. Once you learn a second language you are suddenly able speak to hundreds of more people. It's invigorating on so many levels. How much time did it take to get a full grasp of Japan? This is always an embarrassing question to answer. At first, I figured two years would be more than enough time. But after two years I'd hardly scratched the surface and my language ability was still in its infancy. I committed to two more years and found myself a little further along. It wasn't until the seventh year that I noticed myself making substantial progress in understanding the country and its people on a more profound level. I've heard from other expats that the seventh year was pivotal. Or it could be that I'm slow. Or, more likely, both. I am certainly not a whiz at foreign languages. And then you never really understand Japan completely. Neither do the Japanese. Their history is long and complex, and what was true eight hundred years ago in Kyushu (which was not called that back then) was not true in Tokyo three hundred years later (which also had a different name). It goes on and on. Is all the cultural and historical information about Japan in your books true? Yes! And I work hard to present it in the way the Japanese would—with the important cultural, artistic, and historical nuances intact. I spend an inordinate amount of time to get it right and impart as much of a sense of the subject as I can in the most authentic way possible. I can do this because I did it professionally as an editor on Japanese subjects for years. Plus I wrote a bit on the side. And traveled a lot, drawn along by my curiosity. I want people to get a good feel of whatever Japanese subject I bring up—within the framework of the story, of course. What I won't do is dumb down the Japanese culture, as so often happens. 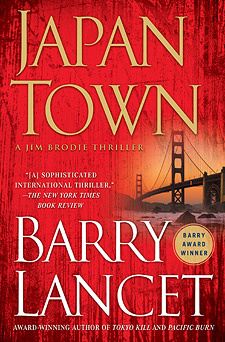 At the end of Japantown, as well as in my forthcoming books, I have a section called About Authenticity that clearly discusses all the factual information included in the book. Did being a book editor help you to get published? That was the plan, but it didn't work out that way. It helped prepare me, but it didn't make the writing any easier. What it gave me was a better understanding of what agents, editors, and publishers do and why, but in the end it was the work itself that needed to win acceptance. As a former book editor, do you have any advice for new writers? I've been asked that so many times as an editor and author that I've included a special Writers' Corner. What's there are tips I used myself and to help authors I was working with as an editor. It's divided into two sections, "On Writing" and "The Business of Writing." Time permitting, I occasionally add to this section. Where can I find the latest information about you and the new Jim Brodie series? The easiest way is to simply sign up for my newsletter, and I'll keep you posted with a message directly into your email inbox whenever I have something of interest to report. Advance information will appear here without fail. All email addresses are kept private. You can also find me on Twitter and Facebook. Stop by and say hello. I post often on what I'm up to or what has caught my eye. And, of course, I'll be updating this website frequently. I recommend signing up for the newsletter as a fail-safe measure, then visiting the Twitter and Facebook when you can. Where can I get signed copies of your books? An increasing number of bookstores are asking for signed editions when a new hardcover comes out. In addition, a few outlets are listed at the top of the Appearances page. If you're still having trouble, drop me a line at barry@barrylancet.com. For publicity, media files, rights questions, and other similar information please go to the contact page. Otherwise, you can reach me by email at barry@barrylancet.com or drop me a line on Twitter or Facebook, both of which I check regularly. Before contacting me, please review the rest of this FAQ for answers to any general question you might have. I have signed up for your newsletter but haven't received anything yet. What should I do? Every email service has filters, and the filters are set differently in each service. The best way to assure you receive the newsletter is to add the address Barry_Lancet@mail.vresp.com to the white list function of your email provider. A white list is a collection of emails you will accept. To be safe, it's also a good idea to add the address to your address book.